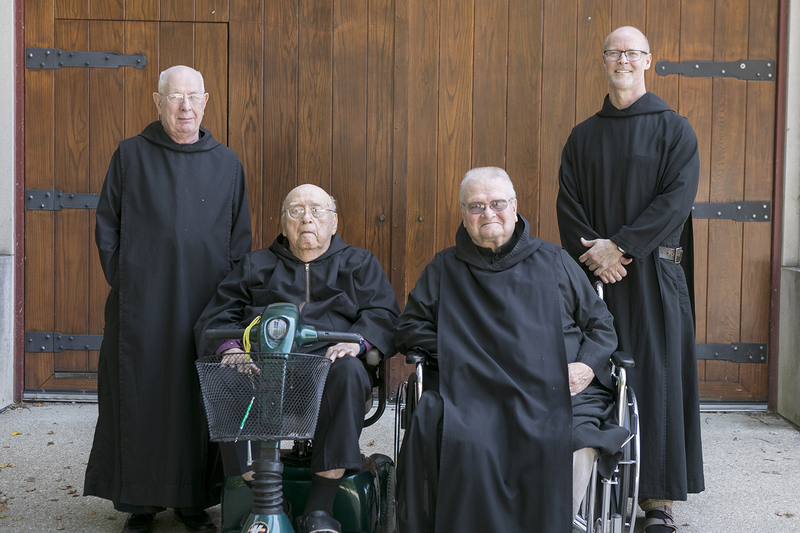 The Benedictine monks at Saint Meinrad Archabbey, St. Meinrad, IN, celebrated the jubilee of monastic profession for five of their confreres on July 29, 2018. Honored were Fr. Bonaventure Knaebel, 80 years; Br. Giles Mahieu and Br. Kim Malloy, 60 years; and Fr. Brendan Moss and Fr. Adrian Burke, 25 years. Fr. Bonaventure was born in New Albany, IN, on September 6, 1918. He professed his monastic vows on August 6, 1938, and was ordained to the priesthood on June 5, 1943. This year also marks the 75th anniversary of his priesthood ordination and his 100th birthday. He attended minor and major seminary at Saint Meinrad, and then earned a Master of Science degree in 1946 from The Catholic University of America. He served as archabbot of the Saint Meinrad community from 1955 to 1966. He was the first Hoosier native to lead the monastery and, at 36, one of the youngest Benedictine abbots. Fr. Bonaventure has served as pastor at Sacred Heart Parish, Jeffersonville, IN, and St. Michael Parish, Charlestown, IN. He has been administrator of the Benedictine monastery in Morelia, Mexico; Corpus Christi Abbey in Sandia, TX; and St. Michael Parish in Bradford, IN. He also served as a chaplain at St. Paul Hermitage, Beech Grove, IN. Br. Giles, a native of Moline, IL, was born on July 3, 1938. He professed his vows on April 16, 1958. He attended St. Placid Hall at Saint Meinrad from 1953-56. He also took courses at Saint Meinrad College and completed a Purdue University pest control technology course. A 40-year member of the St. Meinrad Fire Department, he was named Spencer County’s Firefighter of the Year in 2001. He served as secretary-treasurer of the Spencer County Fire Chiefs Association for 33 years. Br. Giles has also worked in Saint Meinrad’s bakery and electric shop. He was a pastoral assistant at St. John Chrysostom Church in New Boston, IN, from 1984-87 and at St. Martin’s Church, Siberia, IN, from 1987-90. He also served as pest control operator for the Archabbey. He was president of the Indiana Pest Control Association in 1983 and served on its board of directors for eight years. He also handled mail delivery in the monastery and served as the associate district chaplain for the Indiana Volunteer Firemen’s Association. He resides in the monastery infirmary. Br. Kim was born on April 24, 1938, in Mount Summit, IN. He professed his vows on April 16, 1958. He is a graduate of Burris High School in Muncie. He has been custos of the Archabbey Church since 1986, and later he became sacristan as well. Br. Kim is a weaver and makes religious vestments. Previous assignments have included work in Saint Meinrad’s bakery, wine cellar and guest house. He also has served as refectorian, house prefect and on the Archabbey Council. He also managed Saint Meinrad’s fleet of cars and trucks and was in charge of the monastery vestry. Fr. Brendan is a native of Brooklyn, NY. He joined the Saint Meinrad monastery in 1992 and professed his first vows in 1993 and his solemn vows in 1996. He was ordained a priest on June 3, 2001. Since 2015, Fr. Brendan has served as president-rector of Conception Seminary College. The seminary, located in Conception, MO, is operated by the Benedictine monks of Conception Abbey. Other assignments have included director of enrollment and director of Lay Degree Programs at Saint Meinrad Seminary and School of Theology. He is also an assistant professor of religious education. Fr. Brendan has served in parish ministry, as a formation dean and Director of Pastoral Formation in the seminary, and as director of new donor initiatives in the Development Office. He earned a doctor of ministry degree in preaching from Aquinas Institute. Other degrees include a bachelor’s degree from Saint Meinrad College, and a Master of Arts and a Master of Divinity from Saint Meinrad Seminary and School of Theology. He also earned a certificate in supervision from the Seminary and School of Theology. In 2016, he received a Master of Arts in religious education from Felician University. Fr. Adrian came to Saint Meinrad in 1990 as a seminarian for the Archdiocese of Indianapolis. He entered the monastery as a novice in 1992 and professed his vows as a Benedictine monk in 1993. He professed his solemn vows in 1996. Fr. Adrian earned a Master of Divinity degree from Saint Meinrad School of Theology in 1997 and was ordained to the priesthood on June 8, 1997. He also has a bachelor’s degree in marketing from Indiana University. From 1997 to 2000, Fr. Adrian was associate pastor of three rural parishes in southern Indiana: St. Meinrad, St. Boniface in Fulda, and St. Martin in Siberia. He later completed graduate studies in spirituality at the Pontifical University of St. Thomas Aquinas in Rome, earning a License in Sacred Theology in 2003. From 2004-2009, he served as pastor of the above three parishes, and in 2009, he was named assistant business manager for Saint Meinrad Archabbey. The following year, he was named treasurer/business manager and held the position for two years. He gives retreats at the Archabbey Guest House and Retreat Center and serves as pastoral liaison for the Archabbey co-workers. Fr. Adrian is a spiritual director at Saint Meinrad Seminary and School of Theology and teaches in the Graduate Theology Programs. Photo: From left are Br. Kim Malloy, Fr. Bonaventure Knaebel, Br. Giles Mahieu and Fr. Adrian Burke. Fr. Brendan Moss was not present when the photo was taken.